Washington, DC, bids farewell to its former mayor Marion Barry, Jr., with three days of events beginning today. The four-term mayor and city councilman passed away on November 23. 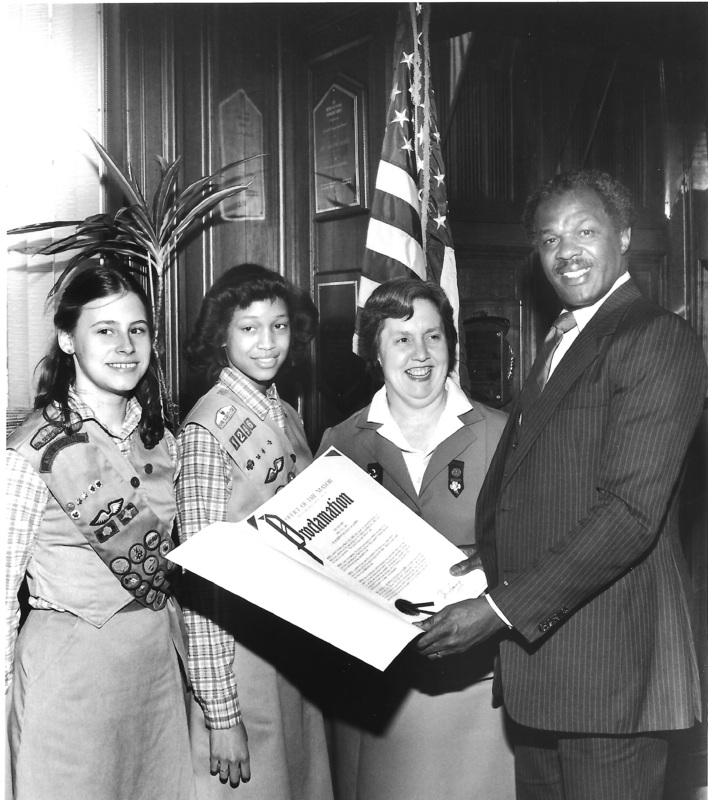 GSCNC President Barbara Lowis Lehmann accepts the 1982 Girl Scout Week Proclamation from Washington, DC, Mayor Marion Barry, Jr. Mary Reese (left) and Myra Ingram observe the ceremony. On February 19, 1982, Washington, DC, Mayor Marion Barry, Jr. issued a proclamation declaring March 7-13, 1982, as Girl Scout Week in the nation’s capital. This entry was posted in Community Service, Events and tagged Barbara Lowis Lehmann, DC, Girl Scout Council of the Nation's Capital, Girl Scout memorabilia, Girl Scouts, GSCNC, Jr., Marion Barry, Mayor Marion Barry, Washington. Bookmark the permalink.